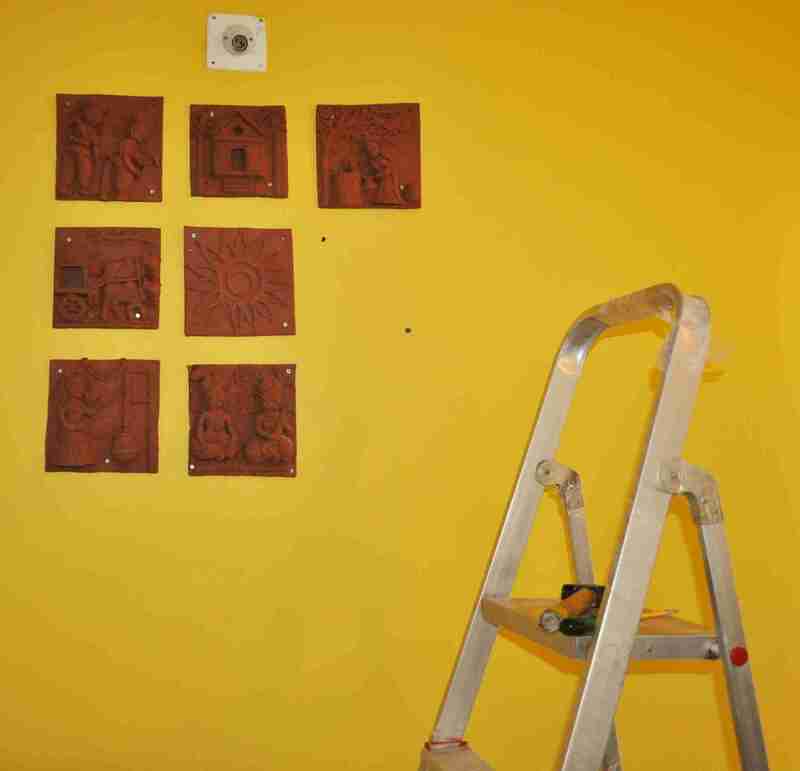 After the overwhelming response on my wall project, I had to write about the craftsman who made those wonderful plaques. Local myth claims that a blind ancestor was granted vision by the local deity ‘Dharmaraja’. The blind man sculpted the god’s shadow on a two dimensional plaque. Thus evolved this practice of making plaques, instead of three dimensional figures. 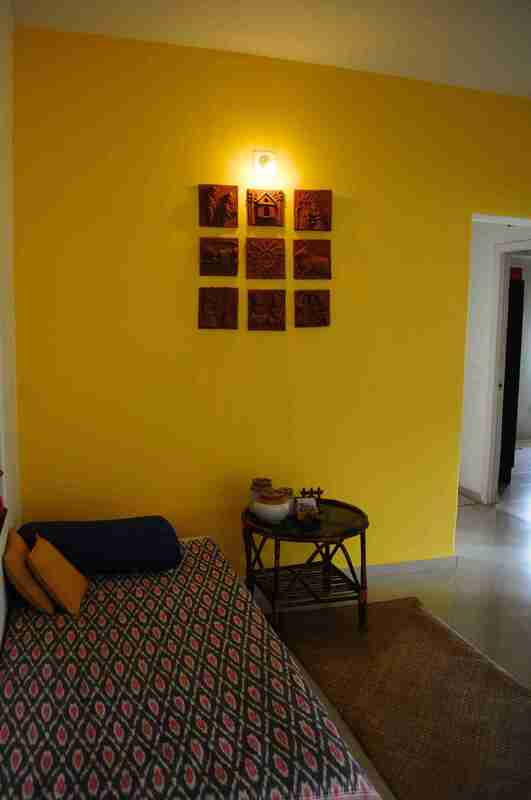 Molela is a quaint village, the one that you will normally miss on your way to Nathdwara. The only signboard is usually hidden under layers of movie posters. 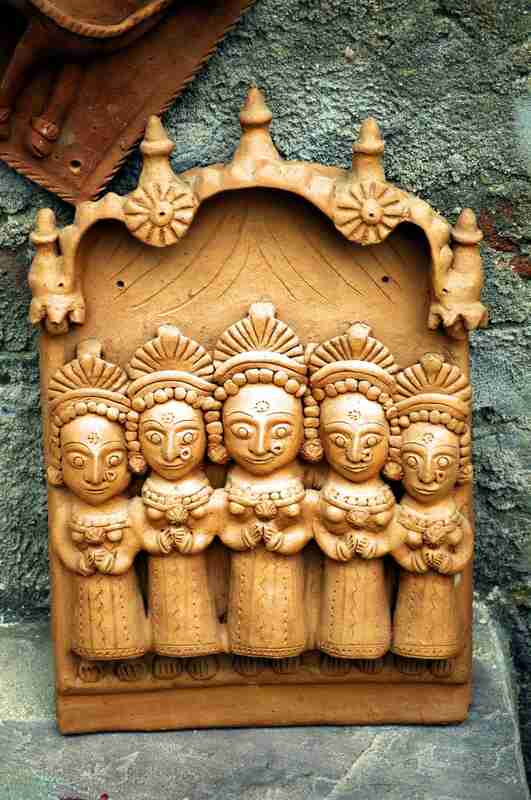 Once you get there, the rows of houses with their terracotta wares is the first sight to greet you. I wanted to visit each one of them. I started with the first one, spent around four hours and reluctantly left the place without any time for the rest. I visited master craftsman Jamnalal Kumbhar’s home. I entered a workshop where his entire family was involved in making these plaques. Here is the picture of his wife putting in the final finishes on the plaque. The entire household revolves around his work. Stacks of these plaques are found everywhere. 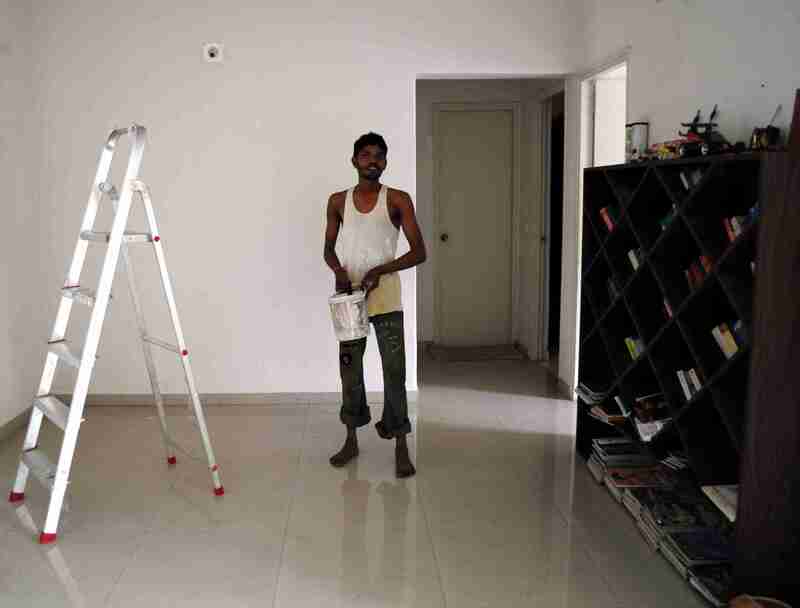 While I was there, Jamnalal was working on an order for a thousand plaques for a home in Delhi! 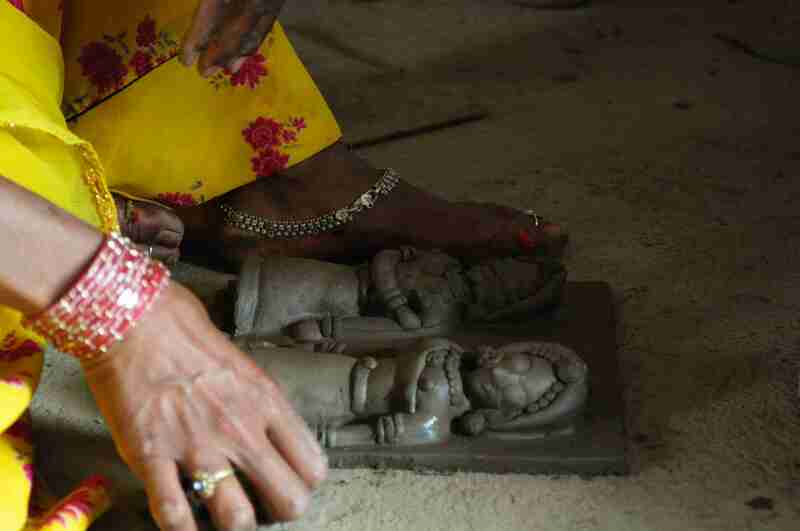 The clay is collected from the local river bed, dried and beaten to a fine powder. This is then mixed with donkey dung (binding agent)! and water. The mixture is used to make the plaques. For the details, balls and strings of this mixture are used. 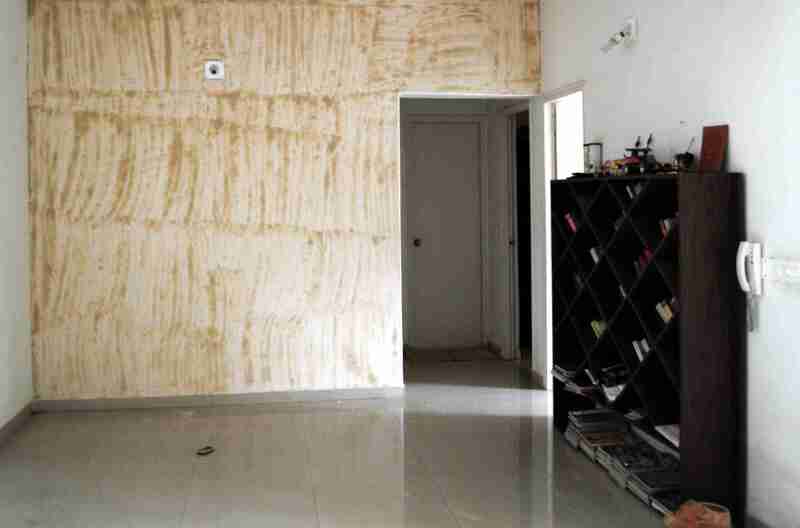 The basic idea is in the craftsman’s mind, which is further improvised on the go. 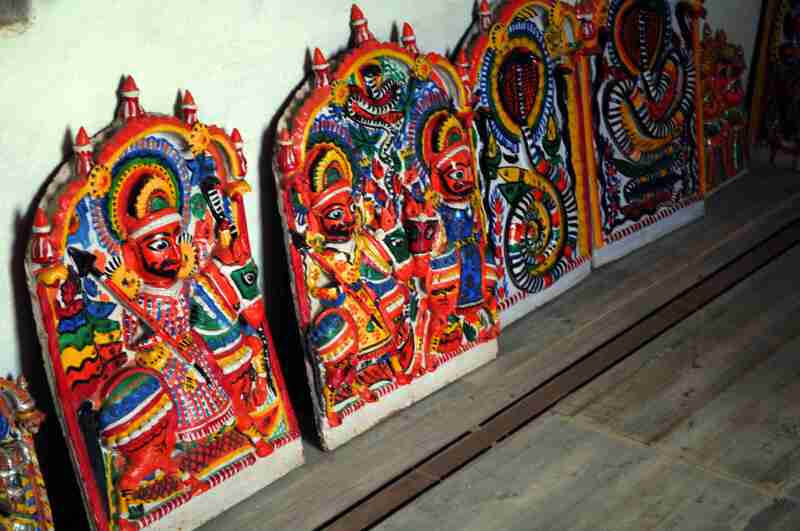 The local deity is ‘Dharmaraja’ and during the months of March-April, tribal communities from as far as Madhya Pradesh come to Molela to buy these brightly coloured plaques. These are then carrried on their heads back home as a ritual. 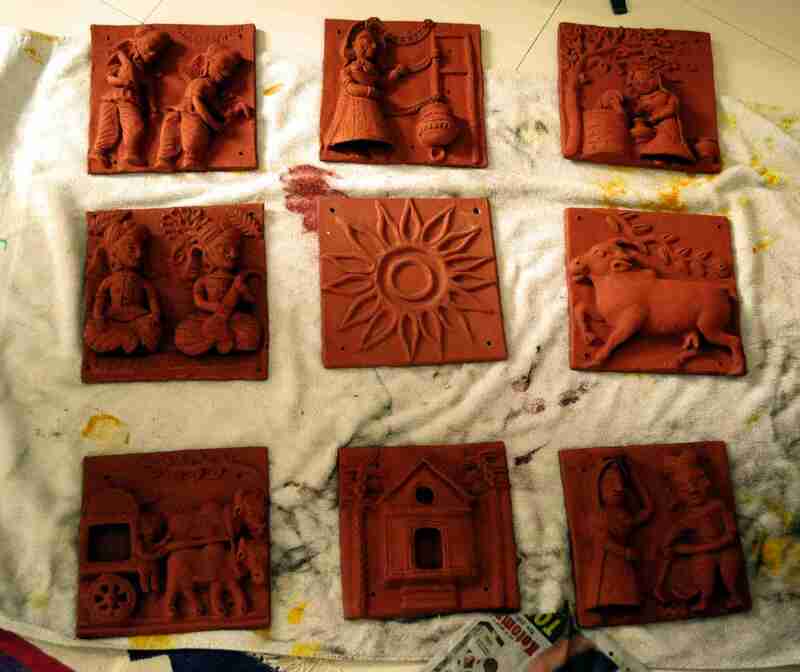 The winter sun is just right for making these plaques that are sold during the summer. The summer sun is quite harsh and can lead to cracking. A plaque with ‘five sisters’ is used as a symbol of welcome in homes. These sisters are believed to welcome the good and ward off evil. 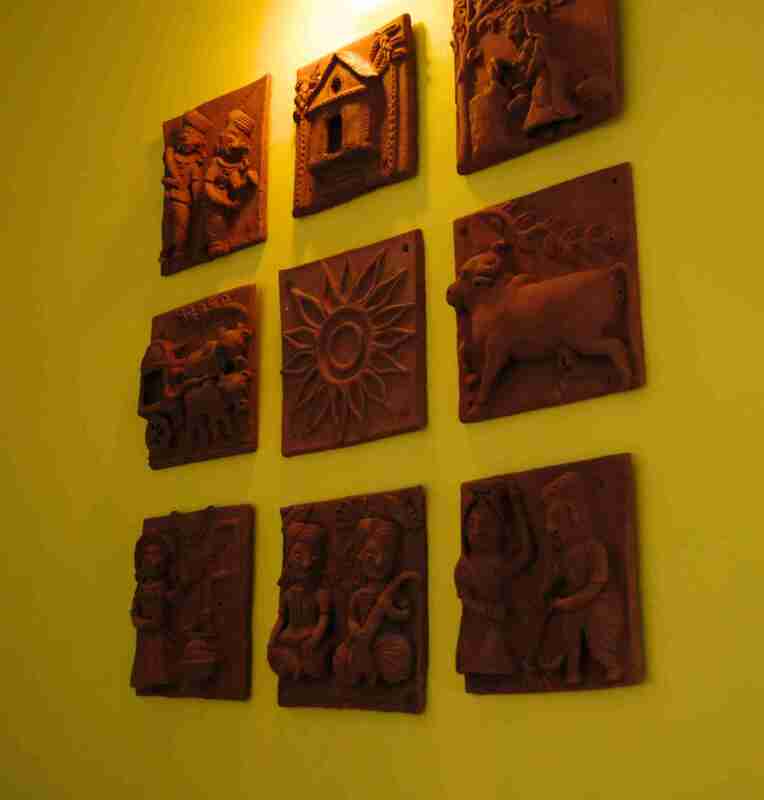 A series of scenes from village life are made using these plaques. 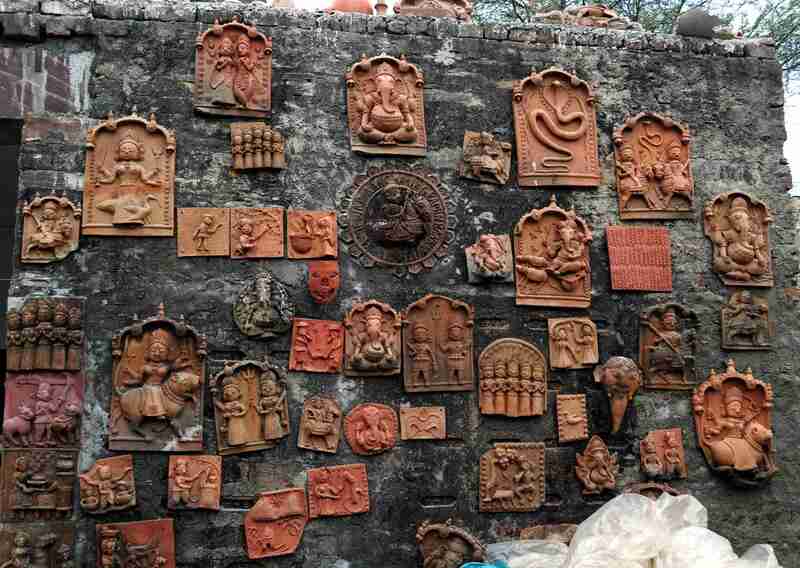 When the demand for Dharmaraja idols dwindled, these smart craftsmen started introducing new designs. 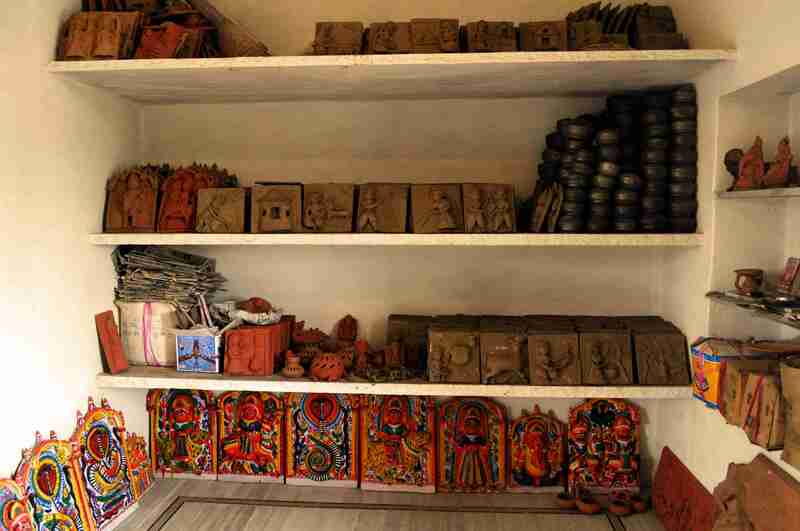 It’s been three months since I’d picked up a few terracotta plaques from Molela, Udaipur. I knew the wall where I wanted it, but I was contemplating a design. Initially the plan was to intersperse this with a few black and white pictures taken during my travel. Then it was a mix of paintings and finally I decided to give it a go. Without the paintings, of course and I am very happy with the result. The wall where I wanted to do this installation. The plain white walls weren’t just right. 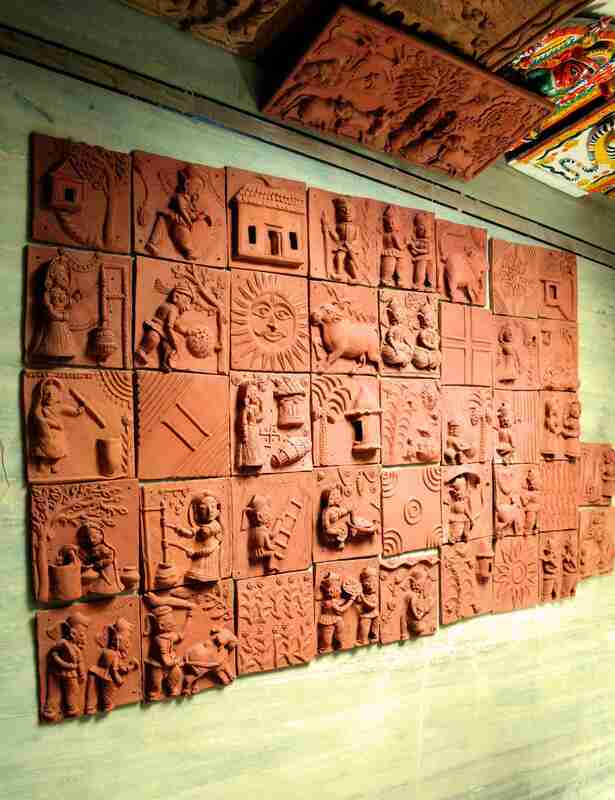 I wanted something that was warm, Indian and would contrast the red terracotta brilliantly. 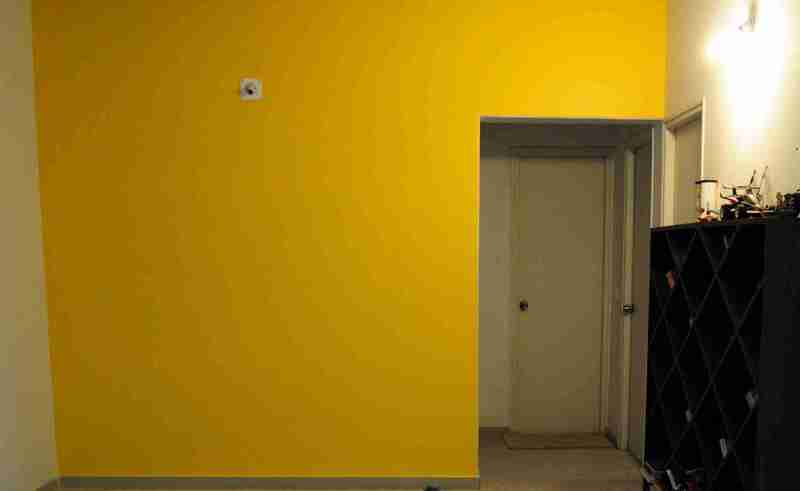 However much I was impatient to have my yellow walls, I had to wait for the process. And it takes time! Yellow is definitely a difficult color. Too bright is tacky and too light is dull. I bought the brightest yellow possible and manually mixed white colour and applied patches till I was sure (almost!). All that effort was definitely worth it. The wall turned out beautifully. Since they were going to be riveted directly to the wall, I had to get the placement right. I tried a lot of combinations and decided to take my friend Shivani’s advice. She said the more intricate ones neeed to go at the end. That would be visually more appealing. Terracotta is tricky. One crack and the whole thing falls apart. I hadn’t really planned it in my head when I bought it. So I had exactly 9 pieces! So it was such a relief once all of them had holes drilled in. One of the plaques chipped a bit, but I cleared this round without much incident. 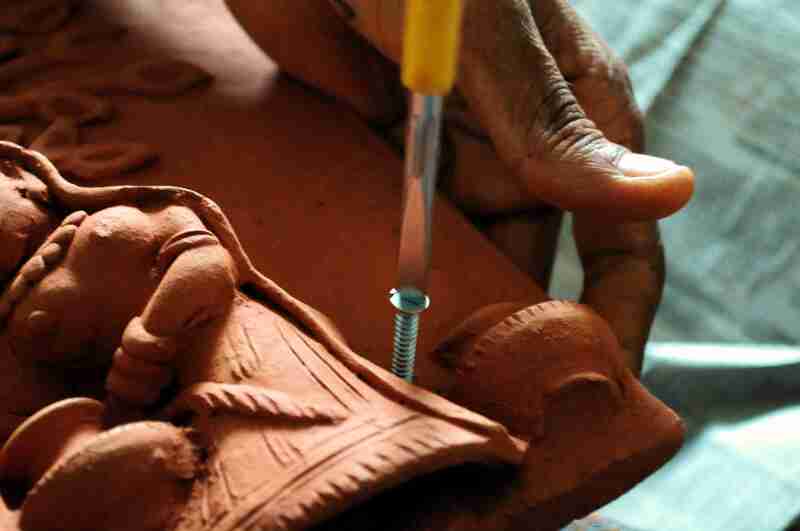 The beauty of handicrafts is in the imperfections. The similarly (almost) sized tiles look fabulous when put together. I used some red color and cement mixture to camouflage the rivets. I cannot even explain how happy I feel, everytime I pass by. 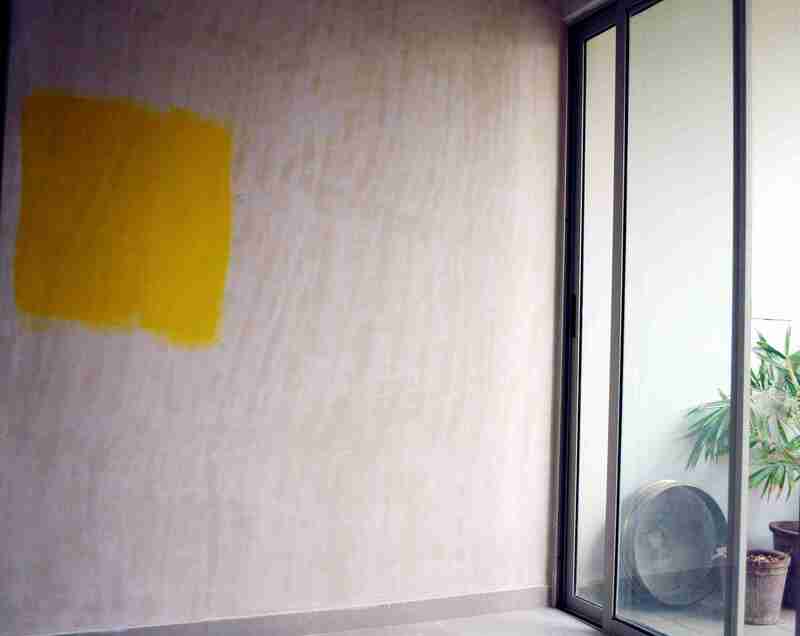 The colour is perfect, the setting is right and brings a lot of character to my home. If you like this and want something like this for your home, just message me!